It's that time of year, when I start sending interesting mechanical things your way as gift ideas. Here's a fascinating kinetic sculpture that gives the illusion of perpetual motion. 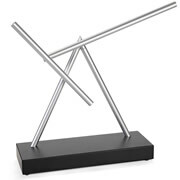 An 11 inch metal rod pivots from the sculpture's 16 inch support bars. A shorter rod pivots around a fulcrum at the end of the longer one. The two bars silently swing around their respective fulcrums with no obvious source of power to keep them going. The trick lies in a tiny electromagnet hidden in the base. The magnet causes the end of the longer bar to accelerate which keeps it going for up to a year of continous movement. It may not be perpetual motion, but that's impressive considering it can do this with only four AA batteries! Here's where you can get what the seller calls The Perpetual Motion Sculpture. Ok, close enough, I suppose.